Repair fees can vary depending on the nature of the repair and parts required. The cost to replace a crucifix or centerpiece is dependent upon the metal type. This vintage rosary was made of sterling silver filigree beads with sterling silver crucifix and centerpiece. 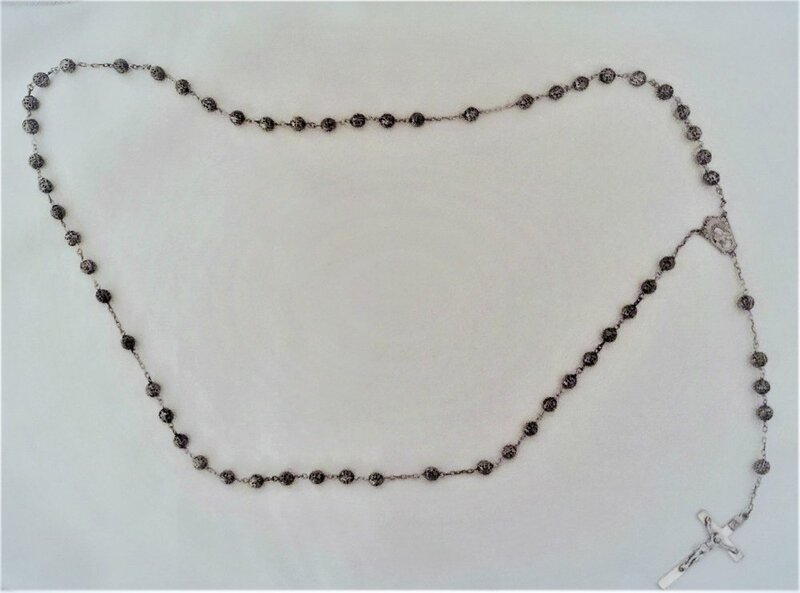 Two of the beads were badly damaged and the rosary itself was so tarnished that it appeared black. This is a before and after of the centerpiece and a pater bead. I was able to repair the two damaged beads by carefully pulling them back into place using needle nose pliers. The centerpiece and crucifix were easily clean up but the beads were so delicate I was only able to get some of the tarnish off for fear of damaging the beads.